With an ENERGY STAR certified refrigerator you can maximize your energy and dollar savings without sacrificing the features you want. Consider buying a refrigerator with a top-mounted freezer. 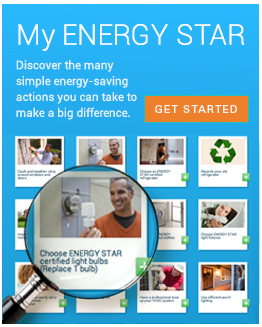 A top-freezer refrigerator that has earned the ENERGY STAR uses less energy than a 60-watt light bulb. Purchase an appropriately sized refrigerator. Generally, the larger the refrigerator, the greater the energy consumption. The most energy-efficient models are typically 16-20 cubic feet. Consider retiring the old refrigerator in your basement or garage. Refrigerators over 10 years old could be costing you about $110 per year to run. If you need a second refrigerator year round, replace the old one with a new ENERGY STAR certified unit and save more than $50 a year in operating costs. Recycle your old refrigerator. If you buy a new refrigerator, be sure to recycle your old one. Many appliance retailers will pick up and recycle your old refrigerator when you purchase a new one. Follow these guidelines to reduce the amount of energy your refrigerator uses. Pledge to flip your old fridge to an ENERGY STAR certified model and help save Americans more than $800 million in energy costs and prevent more than 14 billion lbs of greenhouse gases – equivalent to the emissions from more than 1 million vehicles. Thank you for pledging to flip your fridge!